I am participating in NaBloPoMo this month sponsored by the site, BlogHer.com. Today’s prompt is what is your earliest memory? I have two of them actually and they both are about my dad. It was 1977 or so and we were living in Huntington, West Virginia. I was about to enter school and my mom and dad were arguing all the time. Not something that a six year old little boy should be going through but I was a tough little guy and even then I thought I could take over the world when I was wearing my Aqua-man underoos. My dad wasn’t home much anymore as he had taken a job in Logan as an insulation installer and there was talk of a word called divorce in the Forto house on Collis Avenue. I remember when my dad was home he used to sit with me before I went to sleep and talk with me about little things that little boys find interesting, matchbox cars, Saturday morning cartoons and getting dirty in the backyard. I was having bad dreams back then (of course I was!) and my dad used to give me his watch to hold on to while I slept. I can remember rubbing that old gold plated watch’s face between my little fingers until I fell asleep. There was an odd comfort in that– I can remember it to this day. 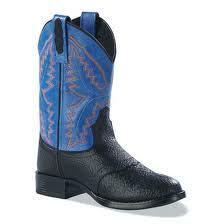 Another memory is one day my dad brought me over a pair of blue cowboy boots for my birthday. I think I had just turned seven and I was in Kindergarten. I wore those little cowboy boots EVERY day until the soles literally wore out and full of holes. I wore them to school. I wore them with shorts and white tube socks pulled up to my knees. I wore them to Sunday school and I think I wore them to bed from time to time too. Here it is over 30 years later and I can not say that my relationship with my dad ever really flourished but I still think about him every day. I make it a point to tell my kids, who are now teens, stories and how important family is no matter what the circumstances. That is one thing that my dad taught me even if he wasn’t around. I wish he could have taught me more. Previous NaBloPoMo: Do you wish the start of the year was in a different season? Which one? This story always makes me so sad – such a sweet little boy to be in such a scary world.